When I was a little girl, I would sit waiting near the front door after I finished my breakfast, waiting for my Dad to come home. A key in the lock, and I would run to hug a man who reeked of smoke and petrol and boot polish, a man who sometimes came home quiet and shaken, and didn’t often talk about his working days and nights. I overheard glimpses of conversation, tiny babies carried lifeless down ladders, a mum found dead in bed with her children cuddled in close and an ashtray on the bedroom floor. A man trapped in a burning caravan, his charred corpse found huddled and clawing at the door. The burning buildings loomed large in fitful nightmares, and to me, my dad was a hero. As were his watch, a loud group of muscular men who we would visit on weekends, share a cup of tea with in the mess room, as they scooped away the lads mags and flung an extra few mugs on the table. I grew up in the Fire Service, running around Southend Fire Station knee high to men who would later become my colleagues as I eventually joined myself, to work in the Control room answering emergency calls and dispatching appliances; a job much harder and more demanding than the in-house joke of ‘the girls on the phone’. Many didn’t last, a revolving door of new recruits entertaining the stalwarts with 20 years service, as staying up for 15 hours to keep your wits about you as a dying woman shrieked down the phone isn’t for everyone. People died, screaming and terrified, in my ear, in unforgiving Sennheiser audio, as I calmly delivered instructions to try to guide them to safety. Seven years later, and those screams never leave you. Many more people were saved, with authoritative direction, with empathy, with logic, level-headedness, by guiding them onto the floor where the smoke would have cleared, to crawl to a window, soothing them up and onto the ledge while a colleague sent radio messages to the firefighters en route to tell them exactly where to throw their ladders. We waited on the other ends of phones in silence as a woman in her 80s jumped from a third floor, for the radio message from the crews that she was alive. Lungs full of smoke and a broken leg, shocked and shaking and sobbing, but she was alive. My dad, who retired last year after over 25 years service to Essex County Fire and Rescue Service, made his views very clear. But none of us were laughing. Not Dad, not me, not Andy from West Mids who writes the Utopian Fireman blog, and certainly not the FBU. 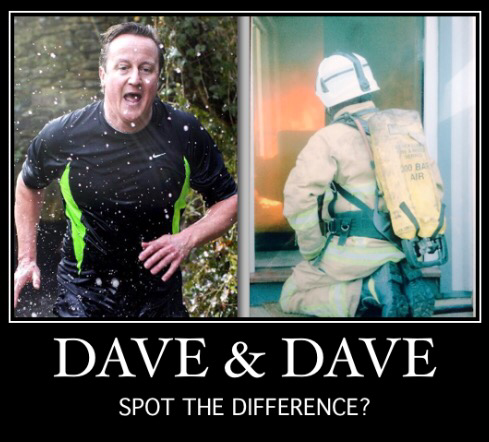 So, David, give me an example of treating people fairly and ethically, as prospective firefighters are asked to do? Oh yeah, cutting the Housing Benefit from parents who use a small spare bedroom to store their profoundly disabled child’s hoists and chairs and specialist equipment. Job Centre sanctions for the woman who didn’t attend her appointment because she was in hospital. And one for the mother of an autistic child who had a breakdown just before they left the house, for good measure. And one for the wheelchair user late to his appointment because his Job Centre didn’t have a wheelchair-accessible toilet, so he had to leave and find one nearby or risk soiling himself in his interview. How about an awareness of the community and understanding its needs? Like closing SureStart children’s centres, not only depriving working parents of a good childcare resource so they could go and do their jobs, but taking twenty people at a time out of employment and onto the dole, with less money to spend in their local communities, and adding to the pool of people applying for a small amount of jobs. Accepting accountability for your own actions? ‘Labour spent all the money and we’re cleaning up the mess’ just doesn’t cut it, I’m afraid. Try harder. How about considering immediate and wider objectives and implications and planning ahead. Cutting, sorry, “capping” benefits means people have less money to spend on their basic living essentials, and end up at the doors of food banks. Any idiot could have predicted that, so why does it seem to come as news to the Prime Minister? And finally, awareness of the impact of changes to the Fire and Rescue Service? I imagine a silence as the PR-brain flails, furiously trying to spin the closures of fire stations, loss of frontline staff, longer response times unravelling years of Community Fire Safety initiatives as all the ‘getting your finger out’ to test your smoke alarm won’t save you if when you need that fire service, it’s too far away. It takes sixty seconds to lose consciousness from smoke inhalation. Every minute counts. Every closed fire station, every appliance taken ‘off the run’ because of unfilled vacancies and skeleton crews, counts. As the old Fire Brigades Union campaign slogan told us, Cuts Cost Lives. Images of firefighters on picket lines, rightly protesting that under new proposals they will be subject to the same fitness requirements at 60 as they were at 18, and will be sacked for failing to meet them. This entry was posted in Fire Brigade and tagged David Cameron, Fire brigade, pensions. Bookmark the permalink.